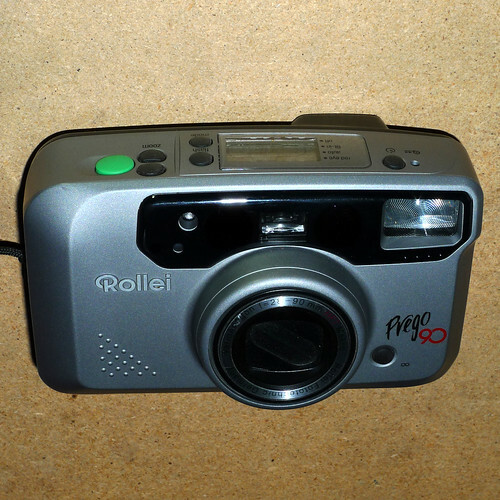 The Prego 90 is a compact autofocus camera for 35 mm film, made by Rollei in the mid-1990s. Other than the lens, it is similar in most respects to the Prego Zoom. Whereas that camera has a 35-70 mm zoom lens, however, the Prego 90 has a 28-90 mm zoom. On most examples seen, this is a Rollei-branded Vario-Apogon, as pictured here; however, some of the cameras have a Schneider Variogon of the same zoom range The Schneider lens is an f/3.6 at the wide end of this range, and an f/9.8 at the telephoto end; it has 11 glass elements in 8 groups. The specification of the Rollei-branded lens is not known. Either lens has Rollei's HFT coating. Like many compact 35 mm cameras of its age, the camera has an LCD screen to display settings, and these are set using various buttons on the top of the camera, and the rear of the top housing. The camera has infra-red autofocus, with an autofocus lock feature, and a button (on the front of the body) to force infinity focus. It focuses down to 0.45 m at the wide end of the zoom range, and 0.57 m at the tele end. There is also a 'snap' mode in which the zoom is set to 28 mm, and focus is fixed for depth of field between 1 and 13m (to remove any delay for focusing). The viewfinder shows a central focus area, two sets of frame limits for close and very close focus. 'Portrait zoom' mode, in which the camera zooms automatically, seeking to achieve a head-and-shoulders composition of the subject. 'Step zoom', in which the camera takes three exposures at different focal lengths (one at the zoom position at which the shutter button is pressed, one half-way between there and 28 mm, and the last one at 28 mm). Panoramic format (13×36 mm); new framelines are automatically shown in the viewfinder when panoramic format is selected. Exposure is fully programmed, but exposure compensation is possible, by up to 3 stops in each direction, and a setting for backlight compensation, which adjusts the exposure by +1½ stops. The metering range is from EV 11 to 17.6 at ISO 100 at the wide end of the zoom range (EV 13.4 to 17.6 at the tele end). The film speed is set with DX codes from ISO 50 to 3200; if uncoded film is loaded, the meter defaults to ISO 100. The shutter speed is selected automatically in the range 1/3 to 1/400 second in normal use. There is also a 'B' mode, allowing exposures from 1/2 to 60 seconds. The camera has several self-timer functions; the delay can be set to two seconds or ten, and there is a self-timer setting in which the camera takes a second photograph shortly after the first (to allow the subjects to relax). There is also a remote-release accessory for the camera, and a setting in which the camera will take exposures unattended, at any interval set between ten seconds and an hour. The film is advanced automatically, including advance to the first frame when a new film is loaded. It is rewound automatically at the end of the roll; there is also a facility to rewind the film before the end. The camera has a small built-in flash, with the usual features for a camera of this type: options for automatic flash activation in low light, forced fill-in flash, flash with a pre-flash for red-eye reduction, and to disable the flash, with indicators for each in the LCD. Some of the cameras are fitted with a date back, allowing imprint of the date and/or time of the photograph in several formats. The camera measures 132×75×56 mm (width×height×depth) and weighs 320 g. It requires two CR123A batteries. The date back, if present, requires one CR2025 battery. ↑ User's manual; source of most of the detail in this article (the manual is for the Prego 90 AF, according to the title page: all Prego 90s have autofocus, but it is possible the AF denotes the addition of the Schneider lens. AF does not appear in the name on the camera body) at Orphan Cameras. This page was last edited on 5 February 2013, at 02:33.